Amazon shares have broken through $2,000 for the first time, closing the gap between the internet retailer and trillion-dollar tech rival Apple. 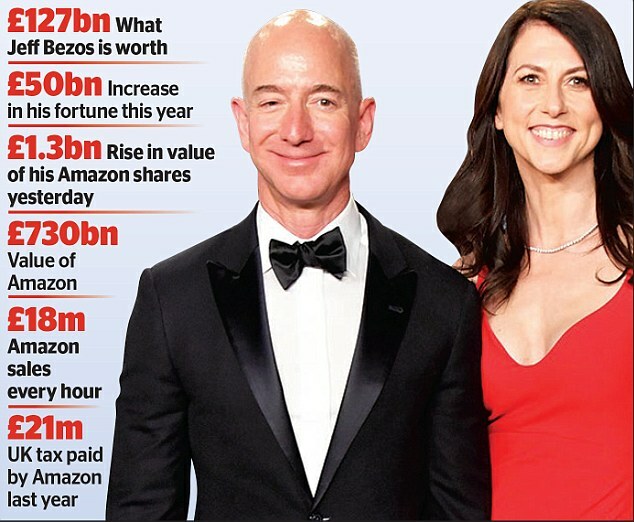 It added £260m to the fortune of boss Jeff Bezos (pictured below with his wife MacKenzie) in a single day. Last night Amazon was worth £726bn, following a near-70 per cent surge in its shares this year. Former Tesco chief executive Sir Terry Leahy said Amazon will overtake Apple to become the world’s largest public company because it has ‘reinvented shopping’. Bezos, 54, owns 16 per cent of Amazon. He overtook Microsoft’s Bill Gates last year as the world’s wealthiest man, and become the richest person in modern history in July as his fortune hit £115 billion. Yesterday he was worth £126 billion.